Yesterday afternoon my best friend and I head down to EGX Rezzed, a 3 day gaming event in London and Germany this year. As many of you may know from my Instagram and social media, I am currently preparing for my PhD in Digital Gaming in studying the interactive benefits of gaming, in a comparative study of two popular titles. This is my first gaming event and I was kindly given a 3 day press access pass. I will be attending EGX in October and EGX Berlin in November 2019. It was a great experience, I am so in ore of how talented game developers are in creating some of the most user friendly, unique, new games for the current market that I have ever seen. It was great to see driving games taken to another level with Porshe's VR simulated driving experience, and many exciting innovative games for consoles including Nintendo, PlayStation, Sega, X Box and PC. I played a few new games including NBA 2K19 which I came home to immediately download after beating my best friend in the first 3 quarters! In the final 4th quarter he was set for a victory until the internet connection unexpectedly cut! I will be learning the basics this afternoon, I love basketball. I also played, WWE 2K17 a wrestling game which was too hilarious and had me in fits of laughter! And also Injustice, a superhero streetfighter style game, very dope. EGX is one of the best annual gaming events and I cannot wait to attend EGX in October which I heard is the extravaganza! Bigger titles, bigger event, even more gaming experiences. So excited. 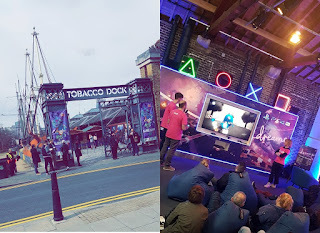 My ultimate gamers dream is to take my boyfriend to E3 in Los Angeles, California, I'm gonna make that happen ;) Check out more pictures from my afternoon at EGX Rezzed here.